The Alverno_Ca team characterized BBa_K2066035, which contains BBa-B0034, as well as a series of other plasmids using TX-TL, a mean of in vitro transcription and translation using cell extract. 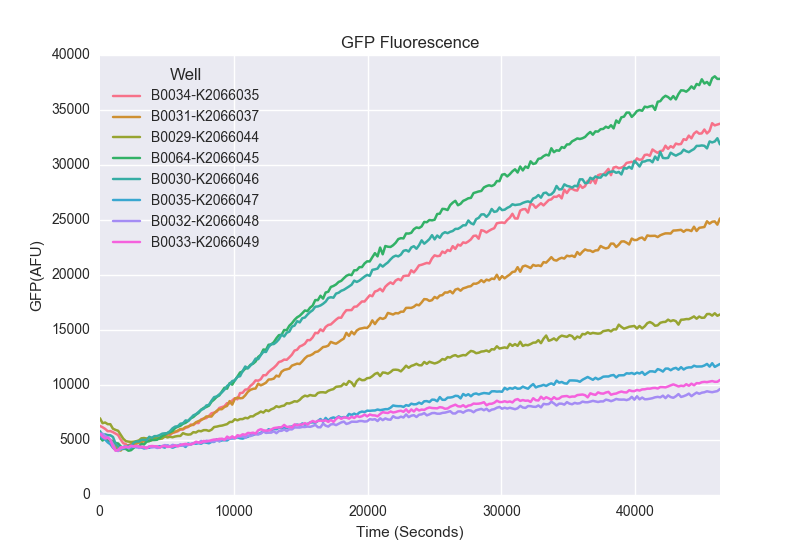 Below is a graph of normalized expression of BBa_K2066035 in comparison to the other palsmids in the sequence. The part worked as expected when used with BBa_E0030. Read additional results at http://2012.igem.org/Team:UIUC-Illinois/Results. Our miniprep, double digest and gel worked properly. We used this part in fusion PCR for building our biobrick BBa_K182102. The fusion PCR, cloning and sequence were all correct. The ligation of part BBa_K190028 behind the RBS was successful, confirmed by gel (correct vector size after digestion with EcoRI and PstI) and sequencing with VF2 primer. We used this part in combination with several genes for building our biobricks e.g. BBa_K190061. Defining efficiency for an RBS seems misleading, since RBS efficiency can only be considered in context of its upstream and downstream sequences as this article demonstrated. 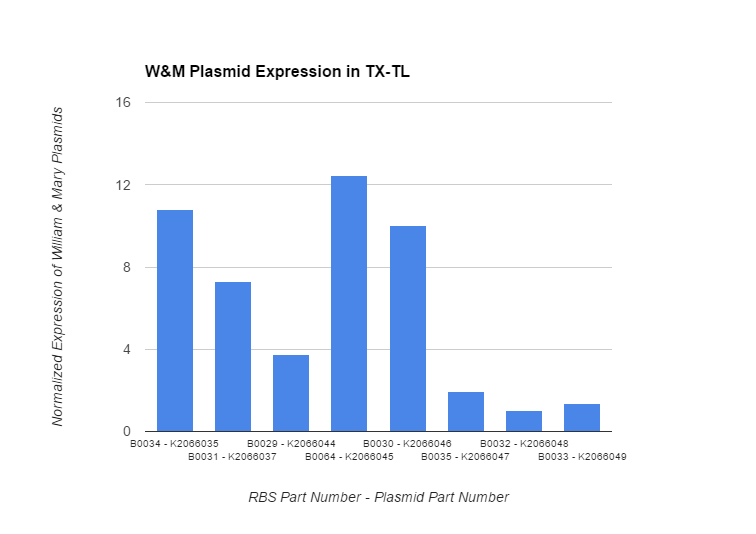 Our results show proteins can be expressed at low temperatures using this RBS. From this we conclude that the RBS is useful for translation in cold environments. The function of this part was characterised in a new salt-sensing device. This ribosome binding site (BBa_B0034) was linked up to GFP (BBa_E0040) under the control of an OmpR-responsive promoter (BBa_R0083). The new composite part (a reporter) (BBa_K1012005) was found to work as expected, inducing GFP production under osmotic stress conditions. The complex RBS-promoter acts as a whole regulatory element and determines the amount of translated protein. RBSs have been reported to have an un-modular behavior, since the translational efficiency is not independent on the coding sequences, but variates as an effect of different mRNA structure stability [Salis et al., Nat Biotec, 2009]. In addition, it is not possible to separate the effects of the sole promoter and of the sole RBS on the total amount of protein produced. For this reason, every combination 'Promoter+RBS' was studied as a different regulatory element. measure the output of the circuits and calculate the RBS efficiency as the ratio of the output relative to the output of the circuit with the standard RBS (BBa_B0034). This simple measurement system allows the quantification of RBS efficiency depending on the experimental context (i.e. : promoter and encoded gene). Today it has not still been completely validated the hypothesis that every functional module in a genetic circuit maintains its behavior when assembled in complex circuits, even if many researchers implicitly accept this hypothesis when performing characterization experiments. To rationally assess the impact that this hypothesis has on the genetic circuit design and fine tuning, several measurement systems were built to evaluate the dependance of RBS modularity from the promoter or the coding sequence separately. 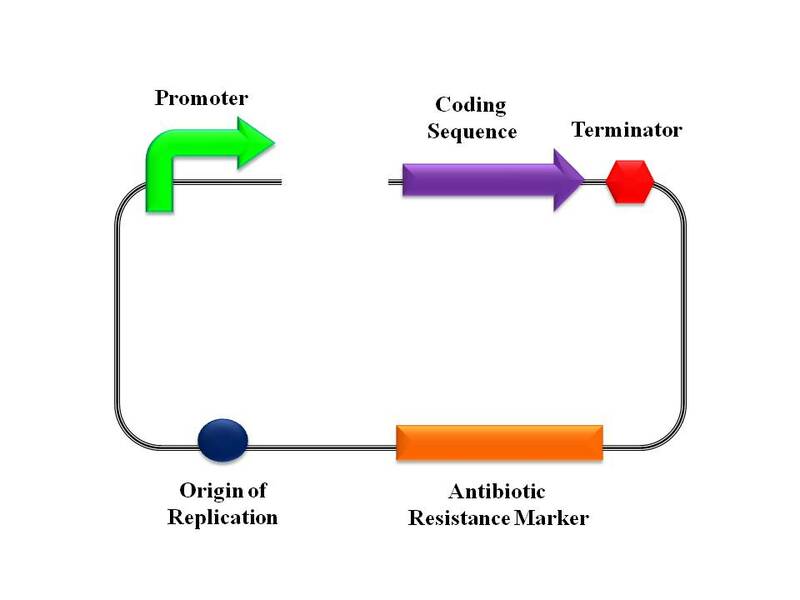 *** The RBS efficiency for pTet promoter driving the expression of AiiA enzyme was computed as the ratio between the percentage of degraded HSL after 7 hours of the studied system and the reference B0034 in E. coli TOP010, in high copy number plasmid pSB1A2. **** The RBS efficiency for promoters driving the expression of LuxI was computed as the ratio αpTet, RBSx/αpTet, B0034 estimated from the measurement systems pTet-RBSx-LuxI. αpTet was estimated as described here. pTet was tested at full induction (100 ng/ml). The results reported in the table suggest that the RBS efficiency ranking is not always maintained. In particular, for the different promoters driving the expression of mRFP, the ranking of the declared efficiencies is maintained for pLux, but not for pTet and J23101. The RBS B0030 results to be the most efficient for both J23101 and pTet, but not for pLux (NB: this effect might be due to an effective non-modularity of RBS, but also to saturating phenomena occurring for this very strong promoter at full induction). RBS B0031 always shows a very low efficiency, while B0032 an intermediate efficiency between B0031 and the stronger RBSs B0030 and B0034. For what concerns the encoded gene variation, more significant differences can be observed. RBS B0030 has the higher efficiency only for mRFP, while the values for AiiA and LuxI are similar (~0.5). Unexpectedly, the weak RBS B0031 has a higher efficiency with AiiA gene (0.83), while with mRFP and LuxI. With B0032 no activity was observed for LuxI, while for AiiA and mRFP the results are quite consistent with the one reported above.